Heel Pain in Toccoa Solved for 70% Less! Suffering from a heel pain injury? Hurt to place any weight on your foot or heel? You may actually suffer from many types of foot pain, including Achilles Tendinitis, Heel Spur Syndrome or Plantar Fasciitis. We can help! The heel is the most complex and unstable joint in the body and it tends to get injured easily. At Freedom Orthopedic of Toccoa we view heel pain relief surgery as a means of treating injured heels. 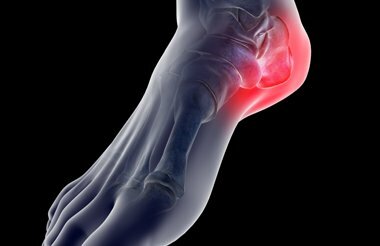 Heel pain is one of the top foot conditions people suffer from. With American becoming more active heel pain has almost become epidemic, affecting all ages, and body types.. Orthopedic care is only as good as the diagnostic equipment and expertise you get from your doctor and staff. Dr. Christopher Vaughn and his staff take special care with each patient to make sure your heel injury is properly x-rayed, diagnosed, treated, and cared for so that you heal in a safe and timely manner. Freedom Orthopedic is leading edge care with one-on-one doctor patient care the way it used to be.